During World War II, the Battle of Normandy resulted in the Allied liberation of Western Europe from Nazi Germany’s control. Code named Operation Overlord, the battle began on 6th June 1944 and is also known as D-Day. 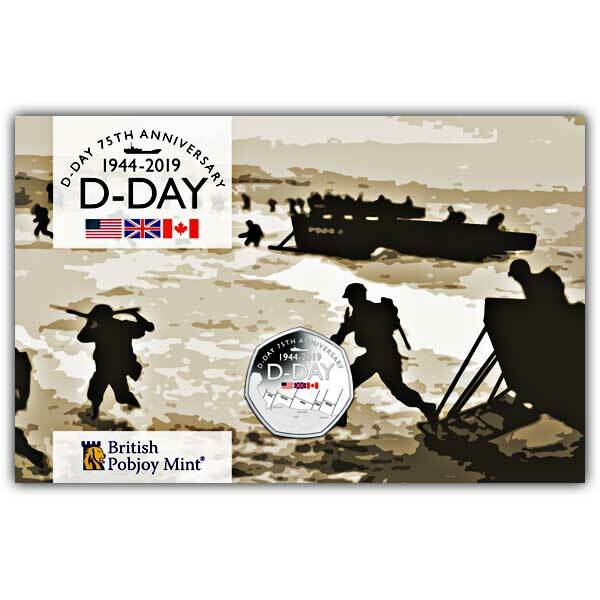 To commemorate the 75th Anniversary of D-Day, Pobjoy Mint is proud to release this special Cupro Nickel Diamond Finished 50p coin on behalf of the Government of Gibraltar. The attack began with paratroopers landing behind enemy lines who destroyed key targets and captured bridges. The next stage involved thousands of planes dropping bombs on German defences with warships bombing the beaches from the water. This allowed the main invasion force of over 6,000 ships carrying troops, weapons, tanks and equipment to approach the five beaches in Normandy. At 0630 hours on 6th June 1944 the troops began landing on the coast of France. US troops landed on Omaha and Utah Beaches while British and Canadian troops landed on the Gold, Juno and Sword Beaches. On this day some 156,000 American, British and Canadian troops landed on these five beaches along the Normandy coast. The design on the coin shows the coast line of Normandy with the five beaches involved in the invasion indicated on the land. The three national flags of the Allied Forces (United States of America, United Kingdom and Canada) are shown in full colour. 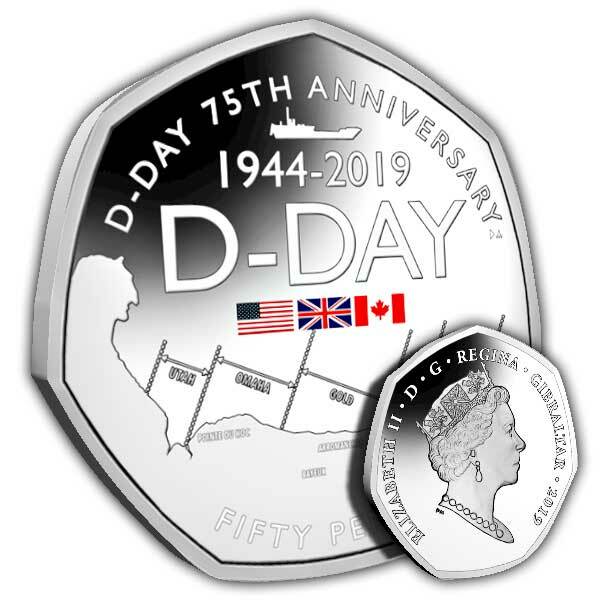 The coin is a reminder of the courage of these troops – as General Dwight D Eisenhower said: “The free men of the world are marching together to Victory!”. The obverse of the coin features the Pobjoy Mint effigy of Her Majesty Queen Elizabeth II.